the popular school in Bangalore, Natyantharanga. Cousin and village sister to the Rajasthani folk dancer featured in the acclaimed "Latcho Drom," Santosh and her sisters taught me the art of spinning, balancing, and helped me to refine my attunement to the rhythms and subtle melodies of pure tribal music. Shubha is pure perfection in dance, matched with heart of gold and unconditional love reflected in her family life, with her students, and in her performances. One can literally feel the presence of the Divine Deities, that come alive in her dance expressions and gestures. She showed me the true power of the Guru, through devotion to life, to dance, and to Nataraja Shiva - the Lord of the Dance. Shubha taught me the fundamentals of all dance - emphasizing perfect form - from the physical elements, to the "bhava," or emotional sentiments essential in portraying the depth of spirituality that exists within the dance form. Santosh's specialties include mastery of the "Goomer," the famous pot dance which she has mastered, dancing with nine clay pots on her head, while on top of metal cups, all the while spinning with her feet covered in 108 bells each, and keeping the beat with the Tabla drums. in Iran, Syria, Spain, Morocco and thirteen other countries. Her research spans both the night-clubs of Cairo and Istanbul, and the villages of Romani Gypsies dancing to traditional acoustic music at festivals, weddings and in their homes. She is a scholar and performer of various ancient dances, such as Sumerian Snake Goddess, and ancient Greek dance. She is also a student and teacher of the Sufi path. With this depth of experience, research, and spiritual passion, Eva carries the ancient art of the dance with every step - and every breath she takes. I studied Veil, finger cymbal percussion, Gypsy Rom, and Turkish Belly Dance with her over the years. 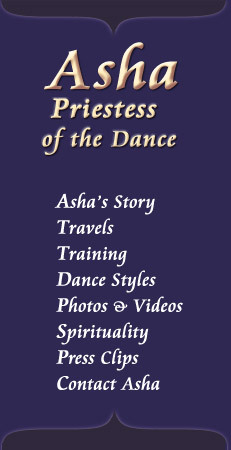 Her style of Belly Dance is the leading inspiration for my Gypsy style, and we share a passion for reviving and preserving the spirit of sacred dance that is lacking in most modern dance forms. When she performs, her audience feels as if taken upon the wings of a bird, flying upwards past the clouds, straight to the heart of space. Visit her website. dancing, teaching and researching dance history, traveling to 33 countries. Her research is used by Egyptian universities, the Middle East Institute in Washington, D.C. and the Library for the Performing Arts in New York. I believe Artemis to be the leading authority on Romani dance, knowing more moves than any one of the village dancers in Turkey - having lived, studied, and performed there for many years. She is a true goddess of the dance, and she incorporates the history, philosophies and attitudes of the Romani and ancient Greek cultures into her teaching work and performances. I am truly fortunate to have been able to study with her over the past five years. Her compassion extends to all living beings - and she is willing to pass on as much sacred knowledge as her students can absorb. Visit her website. One of the brilliant exponents of Odissi dance, Rajashree's dance is marked by gaiety, lyricism, and beauty. Rajashree has performed and lectured internationally, and is a regular artiste in Indian television. With a performing career of more than a decade, Sangeeta Dash has established herself as an outstanding representative of the Deba Prasad 'Bani' of Odissi. A leading dancer in Orissa, she is also a noted actress in Oriya films, and was recently honored with the Mahari Award by Guru Pankaj Charan. Visit her website. Rajashree and Sangeeta are kind, humble, and sweet gurus - and hearing them speak - one would not imagine they are such accomplished masters of this ancient dance form. Odissi dance is the most graceful in the world, and is my personal favorite. Seeing it touches me so deeply, tears flow from the depth of my soul. Mimi Janislawski, PhD, master of classical eastern dance traditions. Mimi graduated from the Royal Ballet of London and is an exemplary exponent of the Tanjore style of Bharat Natyam, in the lineage of Balasundari of Klakshetra and the late T. Balasarasvati. Mimi is a wonderful spirit, and captures the essence of ancient dance. I admire her courage - following her heart and soul to learn Asian dance after leaving her position of Prima Ballerina for the Royal Ballet. She studied Indian, Indonesian, and ancient Egyptian dance, and formed her company, Natayana ("the Way of the Dance"). To me, Mimi is the Isadora Duncan of our time - unrecognized for her true talent. She is the only woman in modern times who has performed an ancient Egyptian dance ceremony in the temple pyramid at Giza. Laurel Victoria Gray has taught and performed throughout Europe, Central Asia, Australia, the United States and Canada. She is a recipient of the Kennedy Center's 2003 Local Dance Commissioning Project Award and the International Academy of Middle Eastern Dance Awards for Best Choregrapher (2003) and Best Ethnic Dancer (1999). Ms. Gray also teaches "Dances of the Islamic World" and "Dances of Egypt" as Adjunct Faculty at George Washington University and George Mason University. Being an expert in both Persian Classical and Russian Gypsy styles, Laurel also preserves these ancient traditions as a living art. As choreographer, dancer, and teacher. Visit her website.